Two thousand and eleven has proven to be yet another exciting and intellectually enriching year for our institute. In our sixteenth year of researching and shaping European environmental policy, we not only continued to provide high quality and innovative expertise to the European community, but we also grew consistently – both in our diversified staff and our competencies. 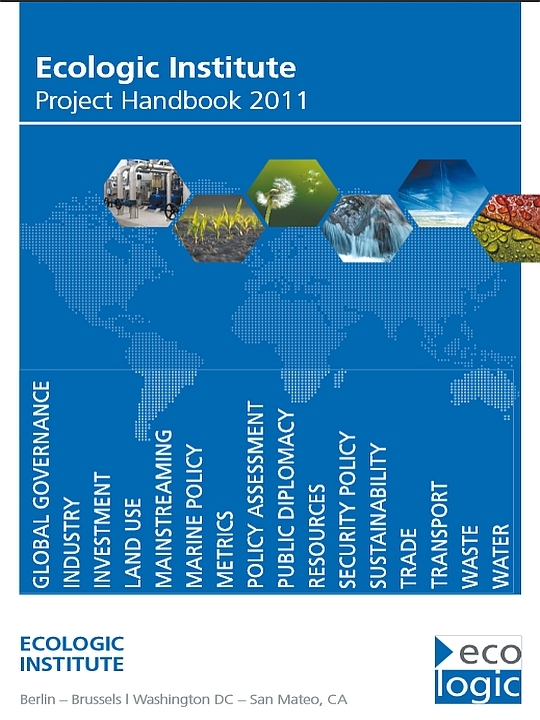 Our Project Handbook 2011 is available for download. Generating knowledge about important environmental issues for both policy makers and the general public is one objective towards which Ecologic Institute strives in multiple facets of its work. Driving forces such as climate change or changing economic conditions often yield unexpected challenges and new opportunities, which require innovative solutions that can only be developed through a combination of careful analysis and creativity. Ecologic Institute is regularly called upon to tackle novel issues and expand the knowledge base required to address them. Sometimes this is simply a matter of bringing together existing policy instruments in new ways, but in other cases, only innovative approaches can provide a workable way forward. A selection of our current activities is outlined in our Project Handbook 2011. The Project Handbook [pdf, 2.1 MB, English] is available for download. Kraemer, R. Andreas et al. 2011: "Ecologic Institute Project Handbook 2011". In: R. Andreas Kraemer and Sascha Müller-Kraenner (eds. ): Ecologic Briefs on International Relations and Sustainable Development. Berlin.